The cities of Indian Wells and La Quinta are located in a desert valley in Southern California known for its year-round sunshine, top-notch golf courses, and a world-famous music festival. Athletes often flock here to train in the winter months, and partake of the area's many palm-tree dotted resorts. The valley extends from the San Bernadino Mountains to the northern tip of the Salton Sea, providing an ideal base for athletes and their families to either stay and soak up the sunny vibes, enjoy adventures into the mountains or Joshua Tree National Park, or even to venture farther towards Los Angeles. Athletes will start their day with a one-loop swim takes place in the clear waters of Lake Cahuilla. This protected reservoir provides an ideal experience for first-time athletes with a sandy beach start. 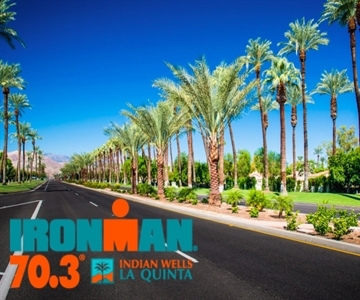 The bike course takes athletes on rural roads past a number of palm tree farms before returning through the city of La Quinta into Indian Wells. The flat course provides gorgeous views of the Santa Rosa mountains while keeping most of the course below sea level. Athletes transition from the bike to the run adjacent to the iconic Indian Wells Tennis Gardens stadium. The two-loop run course leaves the Indian Wells Tennis Gardens area while traversing over to the Indian Wells Golf Resort. Much of the course winds around the lush course on the cart path before returning to the Tennis Gardens between each lap and again at the finish. The design of this course allows for fantastic spectator viewing at multiple points along the course. Professionals compete for $25,000 prize purse plus WC Slot.